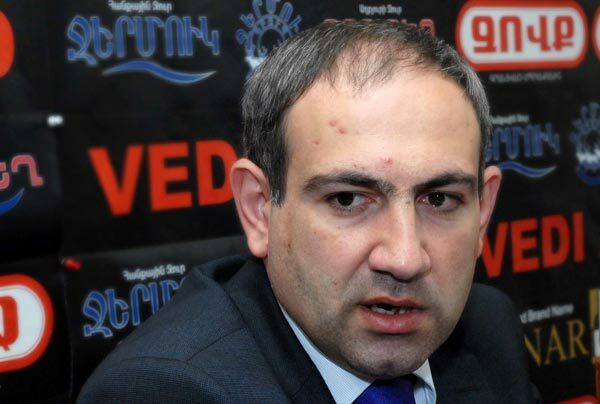 Haykakan Zhamanak daily editor-in-chief Nikol Pashinyan, who is a senior member of ex-president Levon Ter-Petrosyan’s Armenian National Congress (ANC), sees the unfolding dialogue between the opposition alliance and representatives of the governing coalition as a direct result of ‘public coercion’. At a press conference on Thursday, Pashinyan stressed that while formally it was the ANC and government delegations negotiating, it was popular masses that stood behind the ANC. “So, I would call it differently – negotiations between the delegation of Liberty Square and the government delegation,” said Pashinyan, referring to a Yerevan square that has been a traditional venue for opposition gatherings. (Pashinyan was one of the vocal speakers at the nonstop rallies of the opposition in Liberty Square in late February 2008 protesting the official outcome of a presidential election that gave victory to today’s head of state Serzh Sargsyan. The protests were violently broken up, triggering more street protests on March 1, 2008. Pashinyan was later convicted on charges of organizing mass disturbances and sentenced to a lengthy jail term amid opposition claims that he and scores of other activists were, in fact, political prisoners. The 36-year-old newspaper editor was released in May this year following a general amnesty declared by the National Assembly at Sargsyan’s suggestion that applied to about a dozen opposition members remaining in jail and, in fact, cleared the way for an internationally hailed political dialogue in Armenia). Pashinyan told the media in today’s political situation he saw only two variations in achieving early elections – either by means of a dialogue or through popular pressure. Pashinyan said if the authorities failed to hold snap elections within the terms set by the ANC, a ‘watershed’ would take place. “If we consider the possibility of early elections to be exhausted, then the ANC will have nothing to do with these negotiations, but will have something to do in Liberty Square,” he warned. The senior opposition member said the ANC was adamant and uncompromising in its demands. “An early presidential election, which is an opportunity for a smooth resignation of power, is already a compromise on our part,” stressed Pashinyan. At its latest rally on June 30 ANC leader Ter-Petrosyan gave the government until September to decide on holding early elections. Different representatives of the government have rejected the idea of holding snap elections, but acknowledge that the matter is on the agenda of the unfolding talks. The next opposition rally is scheduled for August 2, while the next round of talks between the official delegations of the ANC and the governing coalition is due to take place on August 4.